These earrings are made-to-order so there will be slight variations from the picture. I just love these genuine ruby hearts! I'm a dog person and I enjoy making dog bone earrings. I form the bone, by hand, with argentium sterling silver wire and then heat it with a torch until the two ends fuse together. Each pair is unique. I hammer the bones to add a nice texture and to make them hold their shape. To this pair I added a gorgeous, faceted, genuine ruby heart bead. These handmade earrings are perfect for all you dog lovers out there. Ruby is the birthstone for July. Each pair is handmade so they won't be exactly identical to the picture. The bones and ruby hang from French style sterling silver ear wires. 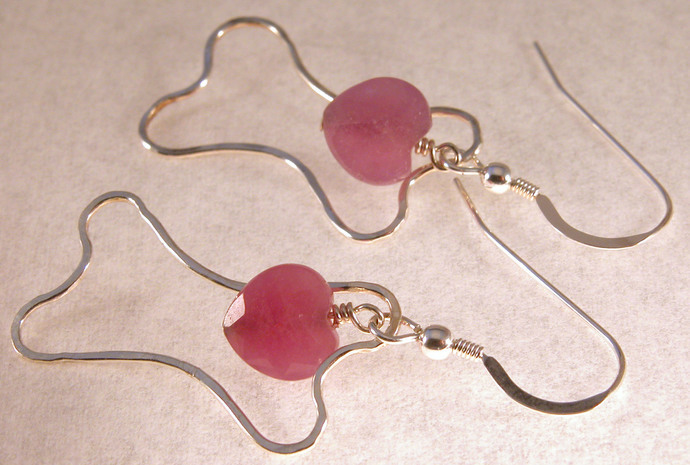 The pink ruby hearts are securely wire wrapped with sterling silver wire. They hang down about 1 1/2" (3.8 cm). Please read my shipping and store policies (http://cserpentdesigns.zibbet.com/faq-and-contact) prior to purchase. I'll always combine shipping if you buy multiple items together. Your earrings will arrive gift wrapped for you to open yourself or give to someone else. NOTE: What is pictured is the French style ear wire in sterling silver.